One night in September after the kids went to bed my wife came into the kitchen where I was doing some dishes, and with an excited look on her face she said “I’ve got a photo opportunity for you!” The last time she said this sort of thing it resulted in this picture, so I quickly grabbed my camera and followed her into the garage where she had been putting away some of the kids’ toys. 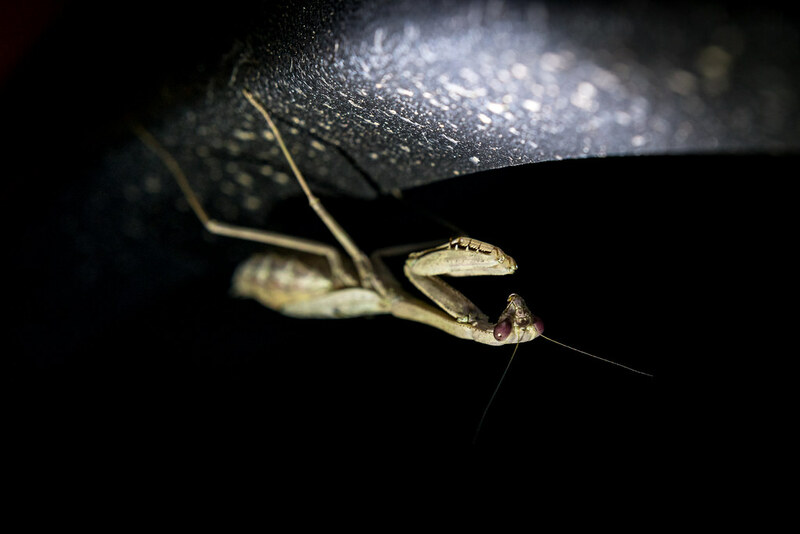 We carefully crept around to the back of our vehicle where she pointed at a small praying mantis perched at the top of the wheel well, and I immediately realized why she was so pleased with her find. I don’t think I have ever seen a mantis up close and personal except for a nature conservatory, and was thrilled to find one just sort of hanging out and relaxing right in our garage. I smiled like a kid on Christmas morning and she said “I’ll leave you to it” so I spent the next 20 minutes trying to get a good picture of the little insect. The first thing I did was put on a +4 filter as I knew I would want to get closer to the mantis, but not so close as to obscure all its features. A +10 filter would have been overkill while a +2 wouldn’t have done much at all, and sure enough the +4 worked admirably. The light in our garage was fairly dim and I didn’t want to open the door because the creature might see that as an opportunity to exit the premises, so I grabbed a flashlight and set it on the floor about a meter away from the mantis with the head angled up so as to provide a bit of light. My 50mm lens was on my D7100 so I took a few shots with that but soon switched over to my D750 because I was shooting at such high ISO values in the dim light, and I also wanted to take advantage of its highlight-weighted metering system to help get the right exposure. More on that in a bit. The situation presented a compositional challenge right from the get-go because it was more than a little awkward to position myself in a way that would allow me to even get a decent picture. I wanted to get the eyes and face of the mantis in focus which meant I had to shoot from below, but with my 50mm lens and filter I had to be somewhat close to the bug as well. I ended up lying on my back and propping myself up with one elbow while holding my camera against my eye with the other hand and scooting around until I had at least somewhat of a decent composition. It wasn’t the most comfortable way of shooting, but it did give me a composition that was at least decently close to what I was going for. As for the metering system, I knew that with my flashlight providing most of the light for the mantis it was going to be tricky for my camera to figure out the exposure values to use since some parts of the scene (like the bug’s face) were so bright and others were so dark. The D750’s highlight-weighted mode basically looks at the entire scene and figures out which parts are the brightest, and then adjusts the exposure accordingly so those bright spots look normal. It’s a mode that I don’t use very often, but is super handy when I need it such as a situation in which there is a praying mantis hanging out above my car tire :) I could have also just shot the picture normally and then used exposure compensation to dial things down a bit so the mantis wasn’t so blown out, but the other method worked fine so I went with that. When I was finally satisfied that I got the shot I was looking for I called my wife back in the garage where we opened the door and coaxed the mantis outside. He had done a fantastic job of letting me get close enough to take his picture, and we wanted to make sure to let him go free before the sun went down completely so he could go find some buddies and chill out after such an intense modeling session. Wonder what prayers the praying mantis prayed while you were taking his picture? Such a devoted little bug, hands always folded in humble prayer. Awesome nocturnal photo. Love the McGyver like techniques. Outstanding shot! If faced with this opportunity, I would have passed it by thinking, “That is in an impossible position to shoot,” without giving it another thought. With your example of succeeding in this situation, I’m going to have to change my attitude and thinking when faced with difficult shots. I’m reminded of a saying my wise mother used to say, “Where there’s a will, there’s a way! lol! Thank you!